This page has been archived. It is provided for historical reference only. While the regulations are available online, this is not the time to try the do it yourself approach. The only way to level the legal playing field is with an informed mineral rights attorney. Should you ever find yourself entertaining a landman’s offer, go get one right away. There could potentially be a lot of money (or a lot of headaches) at stake. Drilling operators in Pennsylvania are required to give the mineral rights owner at least 1/8th of the wellhead price of gas that is produced, but how much would they be willing to spend per acre(1)? That depends on the production that they anticipate from your land. Pennsylvania Marcellus Shale natural gas production interpolation. Please click on the tabs with the compass rose and double carat to remove the gray boxes. Of course, no one knows exactly how much gas a well will produce until it has been drilled, but that doesn’t mean that the industry is blindly poking holes in the ground. The map above is an interpolation map that estimates the amount of gas that would be produced from the Marcellus Shale at any given point in Pennsylvania. This is based on self-reported production data from drilling operators that was posted on the Pennsylvania DEP website. I made this map with a process called kriging, which compares the value of points with other points on the map, and interpolates the values of the areas in between dots. Because of this, the closer a projected value (blue to red contour lines) is to a measured value (black dots), the more accurate it is. In this map, there are several “bubbles” that look like high production areas in the middle of the state that are probably misleading, since there are no actual wells nearby (2). It is probably safe to assume that the industry has more and better data to work with, but even so, some information is better than nothing at all. To effectively use this map, zoom in to the area of interest, click the “i” in the blue circle, and click on the lines on either side of the area in question. A box will pop up with a value, which will be in thousands of cubic feet (Mcf). How much a well on your property would produce is critical in determining whether you would be offered $500 or $5,000 per acre. And for the land owner, it is critical in determining whether or not the whole endeavor is worthwhile at all. After all, why have your peaceful home disturbed by a few months of round-the-clock industry for a couple of hundred bucks? Now that you have some idea of what might be produced from wells on your land, you can get an idea of what you might earn with a royalty calculator. It is just a fact that sometimes things go wrong once drilling gets underway. Upon request, the Pennsylvania DEP provided us with a list of 9,370 violations from 2007 to the end of September, 2010. 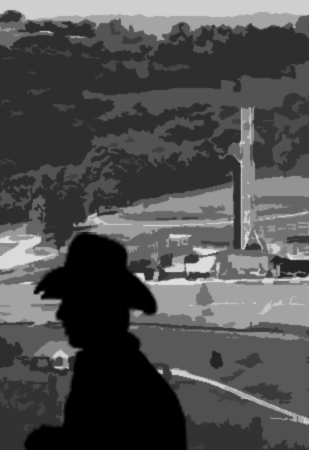 And while who the drilling operator is will tell you something of how likely a violation is, geographically speaking, the wells with a lot of violations are somewhat randomly distributed throughout the Marcellus Shale formation. Number of violations per offending Marcellus Shale well, 1-1-07 through 9-30-10. Please click on the tabs with the compass rose and double chevrons to remove the gray boxes. The map above includes only the Marcellus Shale gas wells that were issued violations by the DEP in the dataset mentioned above. The number of violations per well range from 1 to 37, with smaller values depicted by small blue circles, while the most outrageous wells are large red circles. Obviously, there are some visible clusters in the southwest and northeast of the Commonwealth, because that is where the most wells are being drilled. But a closer look at the map reveals that wells with a lot of violations are actually fairly randomly distributed, with several of the worst offenders in the less productive central part of Pennsylvania (3). The take-home message from these two maps is that while the production of gas from a well on your property can be predicted, wells that cause a lot of problems could happen anywhere. Moreover, there does not seem to be a correlation between the two, as some of the worst offenders are in parts of the Commonwealth where the Marcellus Shale play is relatively unproductive. If you have been approached by the industry’s landmen, then the decision of whether or not to lease is yours. Since the stakes are so high, getting a mineral rights lawyer is essential; if legal counsel seems too expensive, then the lease probably isn’t worth the negative impact of drilling anyway. If you are interested in hearing an offer, estimate the amount of gas that will be produced with the map above, plug the range of numbers into the royalty calculator (4), then decide whether moving forward with a lease is worthwhile for you or not. There are other factors that can be negotiated, including which geologic formations are included. This happens because there are two high density areas of production in the state, in the northeast and southwest. When the kriging computation was made, a high density area between these two areas was assumed, because there are not any low density production values in between. In short, it is due to the curve of the Marcellus Shale field in the state. I actually tried to krig this map as well, but the result was nonsense. It projected Philadelphia to be a high violation area, although the nearest Marcellus Shale well would be hundreds of miles away. This nonsensical map is consistent with a random distribution. The first royalty calculator that I looked for took itself offline because they noticed sharp decreases in production of natural gas after the first year, and wanted to get a handle on the rates of decline. This would indicate that a gas well might just be a short-term financial windfall, which should be another factor to consider. Since, like land above shale, the landman illustration is apparently up for grabs – I grabbed it. >Oh, by the way, thanks to Sam Malone for the great landman illustration!